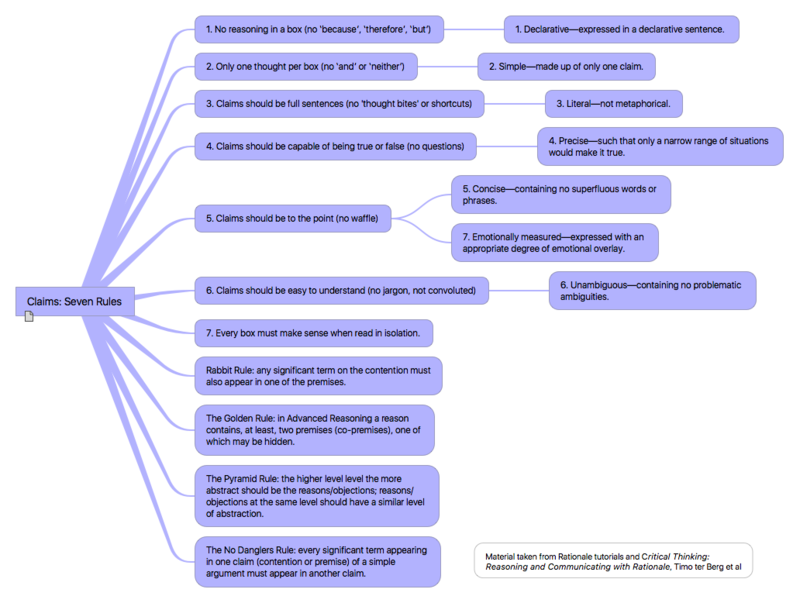 More detail on the structure of an argument map. Click for larger image. Most of the information in the diagram is taken from the Rationale tutorials, which I found quite helpful for “training the brain” in the thought processes necessary to analyse and map an argument effectively—though, by no means, do I consider myself expert. It will take a lot more practice. I won’t go through the information in the diagram in detail; you can study it for yourself. I will highlight a few key points. First, a claim should be written in proper sentences with clear language—no jargon or abbreviations or any kind of shortcut. Secondly, pay particular attention to the different “rules”: the Golden Rule, the Rabbit Rule and the No Danglers Rule. In the next graphic, I summarise the guidance on defining claims from both the tutorials and the e-book (also available as a paperback). Guidance for claim definition. Click for larger image. Evaluation in Rationale. Click for larger image. Evaluation should be conducted from the bottom up. The assessment of the strength of the evidence or argument should be based solely on its support (or rejection) or the claim in the parent box. For instance, in a argument maps about whether the Apollo astronauts landed on the Moon or not, some people have claimed that the lack of dust on the footpads on the Lunar Module is evidence that the landings were faked. In support of this claim, they argue that the Moon’s gravity is only 1/6th of Earth. This claim, while true in itself, does does not provide support for the “no dust on footpads” claim because it is negated by the fact that there is no atmosphere on the Moon. 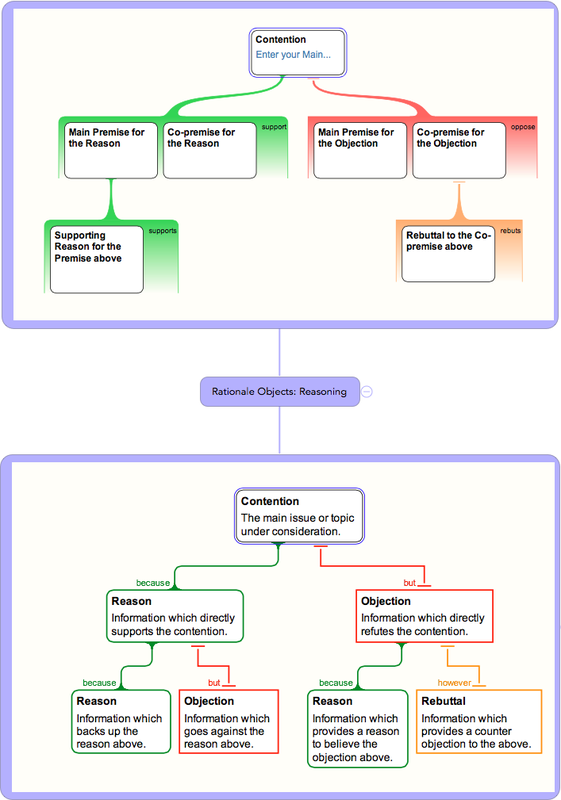 Here’s a pretty simple argument map that shows evaluation for each element. On the balance of the arguments, the contention that “snoogling is good for you” is found to be true. 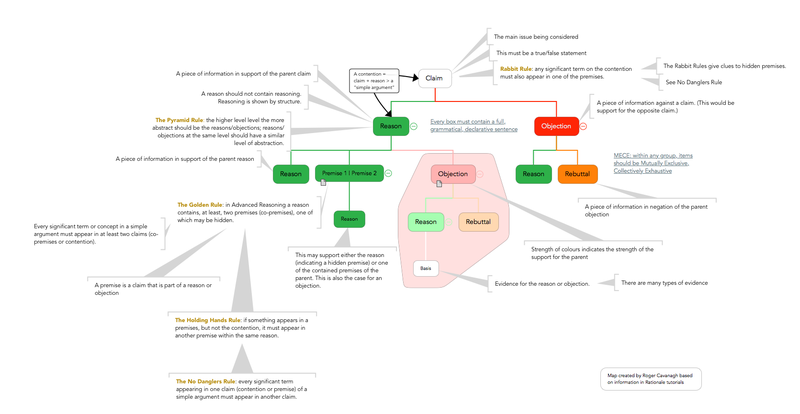 An argument map with evaluations. Click for larger image. In future posts, I plan to take a look at building an actual argument in more detail.